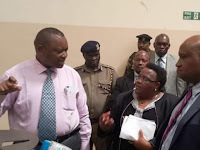 Friday February 8, 2019 - The Director of Criminal Investigations (DCI), George Kinoti, has today led an operation in Thika where detectives seized fake and counterfeit products worth Sh1.2 billion. The DCI, who was accompanied by Inspector General of Police, David Boinett, raided Africa Spirit Limited following a tip off from members of the public. Reports from KRA say that the goods included an estimated 21 million counterfeit excise stamps and 312,000 litres of illicit products. The company is said to have been manufacturing a large consignment of both counterfeit excise stamps and illicit alcohol. The Inspector General added that the company premises have been marked as a scene of crime. “Unfortunately, the owners of these premises have gone to hiding. Why hide if you know you have done nothing wrong?” he asked. Kinoti, on his part, vowed to hunt the owners of the factory and bring them to justice. “You can run but you can’t hide,” Kinoti said.